Discussion in 'The Lounge' started by Dartman, Jan 3, 2008. A speed bag for a bear, how cute. yeah wtf. 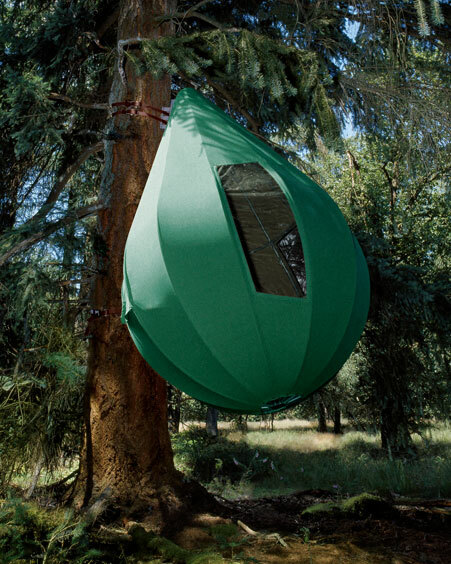 that's for rich folk ,they can understand blowing 50 grand on a tree tent and us common people are going wtf. damn I wish I was filthy rich. My god, with my lack of morals and a huge wad of cash I would rule you all! "Send the kids to granny's every once in a while and let the rising sun wake just the two of you. " Clearly, anyone who buys that doesn't really know what camping is. I picture them bringing along the Land Rover and the Cappucchino maker. I picture them bringing along the Land Rover and the Cappucchino maker. Hey! Thats how I go camping! Rock on up to some wilderness site in LandRover, unload tent, then mattress, Then bedding (no sleepingbags/campstretchers here!) then bbq/supplies etc. Drive 4WD out of sight around corner, return to campsite and feel like you are in the middle of nowhere, but with comfort! No bears here, so break out the beef fillet and foie gras. Chill the champagne in the nearby stream. it's clearly for an outdoor buff whose stubborn girlfriend refuses to go camping unless its off the ground, has a hardwood floor, and is this seasons hot color. He just hopes to get lucky while camping once, just once for christ's sake! I didn't think people who shopped at neiman marcus went outside. The real question Dart is WTF were you doing on the neiman marcus site? "rising sun at crack of Dawn, over." this name should be adopted by all. gonefirefighting named his, "The Chainsaw." Looking for a cycling outfit of course! I was looking at nerd toys on Gizmodo and found a link to it. Warning: Excess use may cause tenticular cancer. I wonder how large of a TV you could cram in that thing?